I have been looking at ways to assist me with Innovation and Thinking and looking outside of the box. Lots of different methodologies exist and there is no right or wrong way to what method to use or when to apply it. After studying several methods in this arena and investigating, reading and learning some of these, I have come up with a set of “Playing Cards” that allow me to play games with Innovation and Thinking. 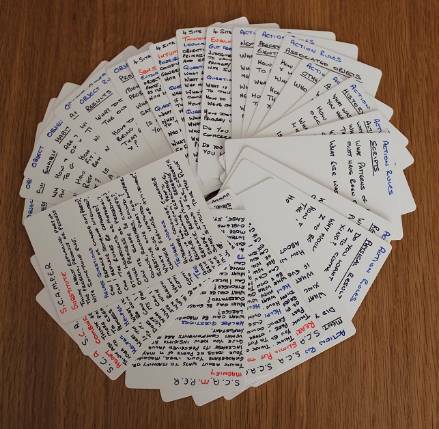 I took a pack of plain/blank playing cards and wrote out cards with different methodologies and ways of tackling/working on innovation. For the problem or area that I am wanting to tackle I shuffle the pack and apply 4-5 cards then work through it based on what has been dealt. The lens cards may be shuffled in the main pack or dealt at the side one at a time. Set a time limit on the cards dealt and then brainstorm writing everything down. No thought or idea is a bad idea until it is qualified in or out. When the time is up either play a different lens card against the cards on the table – or collect them up and shuffle the deck and start again. I have found that using the cards gives me different view across different methodologies rather than just applying one. Sometimes the cards do not result in too much on the page, but other times they flourish ideas and innovations around the problem or area I have been looking at. Next I plan to add more methodologies to the pack and expanding the cards already produced, although I don’t think that I will expand this pack much more as it then may become cumbersome and be too large to be effective. I do have some blank cards left though so may innovate something new around the next thing to do with them.